If you’ve ever been confused about CBD, you’re certainly not alone. CBD is still a very new industry…one that’s shrouded in uncertainty. At CBD School, we understand there’s a ton of misinformation regarding CBD floating around. We’re here to clear up some of this confusion…and support CBD companies that are doing the same. Palm Organix is one of these companies. 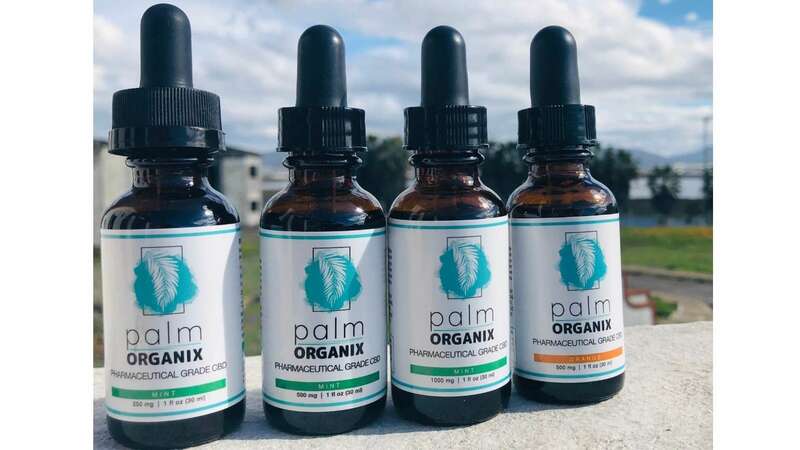 Founded with a mission to offer an educated solution of high-quality, premium products with a simplistic approach to CBD, Palm Organix is doing exactly what they set out to do. To bring consumers the highest quality CBD products, you’ve got to start out with the highest quality hemp. This is why Palm Organix products are not only produced with US-grown organic hemp, but also why they set out a three-step process to ensure you’re getting a quality product you can believe in. One of the main things Palm Organix set out to do when starting out was to ensure they offered a product that was 100% THC-free. While some CBD products do contain trace amounts of THC (less than 0.3% is considered legal), not everyone desires even these small amounts of THC in their system. Whether THC is against your personal beliefs, religious beliefs, or you can’t afford to fail a drug test, Palm Organix has you covered. 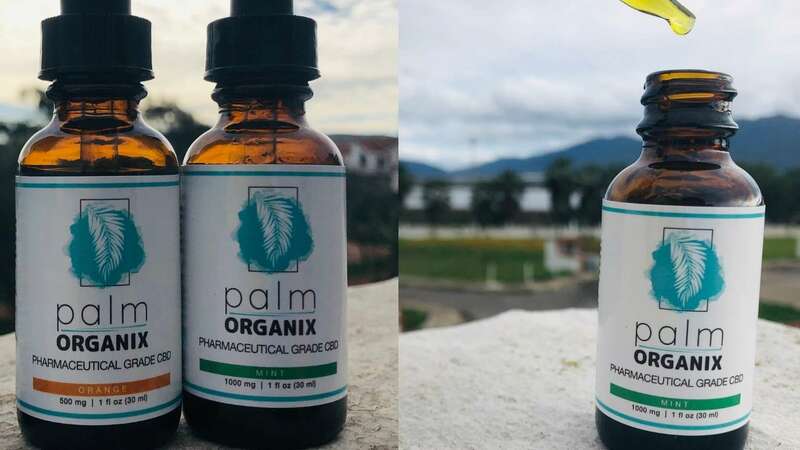 When creating their line of CBD products, one goal of Palm Organix was to tailor their products to fit the specific needs of individuals looking for natural remedies or alternatives to their regular prescription medications. We recently interviewed founder Alex Herrera on the CBD School Podcast. Listen to the interview below to get more insight into Palm Organix! So, did they accomplish what they set out to do? By far, one of the most popular ways to take CBD is in the form of a tincture. Why is this more popular than other methods of delivery? Well, for one, taking a CBD tincture works quicker than most other methods of delivery. If you’re looking for quick relief, you’ll find it by taking a CBD tincture. CBD tinctures are taken sublingually and help under the tongue for about 1-2 minutes before they’re swallowed. Sublingual application allows for faster delivery because the CBD oil absorbed by the mucous membranes, where it then makes its way into the bloodstream to quickly work its magic. By bypassing the digestive tract and liver entirely, effects are typically felt quicker than other products such as capsules or edibles. 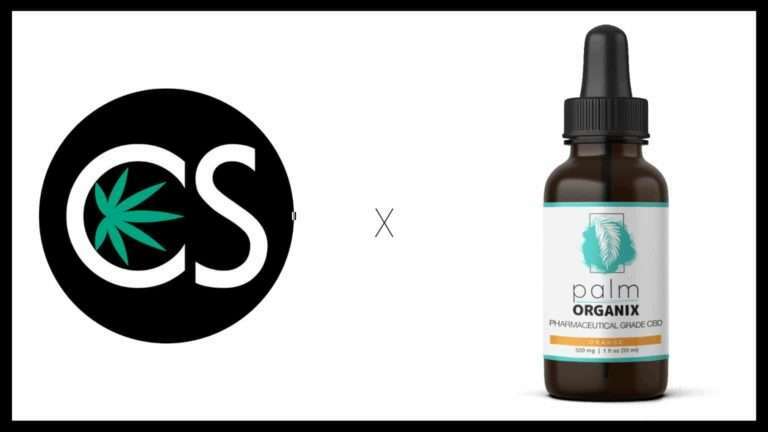 After learning more about the mission of Palm Organix, we couldn’t wait to try their pharmaceutical-grade CBD tinctures. Tinctures are something we take regularly and are always on the lookout for a new company with a tincture we love. After trying Palm Organix, we’re confident it’s one we’ll continue to come back to. 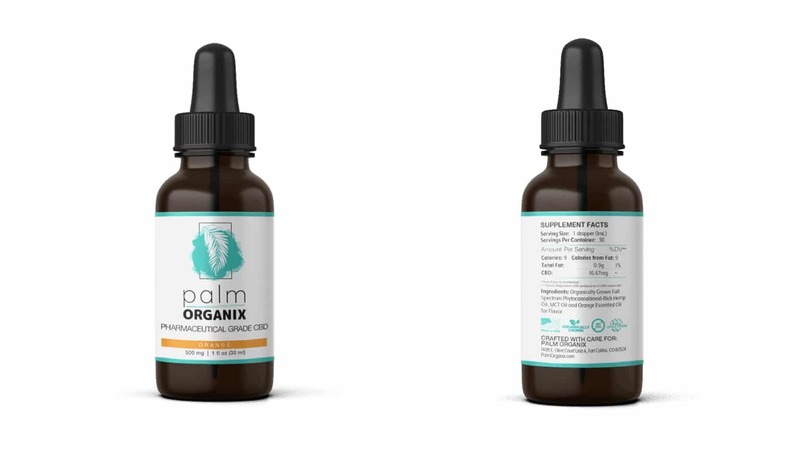 Palm Organix has CBD oil tinctures in three different milligram options: 250mg, 500mg, and 1000mg. Each is made with simple, all-natural ingredients, which is something we know is important to many consumers who use CBD. It certainly is to us. Anyone looking for an all-natural product without artificial colors or flavors will find it in Palm Organix CBD tinctures. While everyone is different when it comes to dosing, we’ve found that about 50-60mg of CBD/day works best for our personal needs. For this reason, Palm Organix 1000mg CBD tincture was the first we tried. One dropper-full contains 33.33mg CBD. The all-natural ingredients that make up their 1000mg mint tincture include: organically-grown full spectrum phytocannabinoid-rich hemp oil, hemp seed oil, grape seed oil, peppermint essential oil, and stevia. Not long after taking 1.5 droppers, we definitely noticed a positive difference in our focus and concentration. The minty taste was subtle and not overbearing in the slightest. Because Palm Organix tinctures are made with all-natural ingredients, there is a distinct earthy taste to the oil. While we’re good with this “natural” taste, we want to make it clear that their mint CBD oil does have an earthy undertone to it. Not everyone is looking for large doses of CBD. When it comes to CBD, less is often more. That’s exactly why Palm Organix gives you options. The all-natural ingredients that make up their 500mg orange tincture include: organically-grown full spectrum phytocannabinoid-rich hemp oil, MCT oil, and orange essential oil. 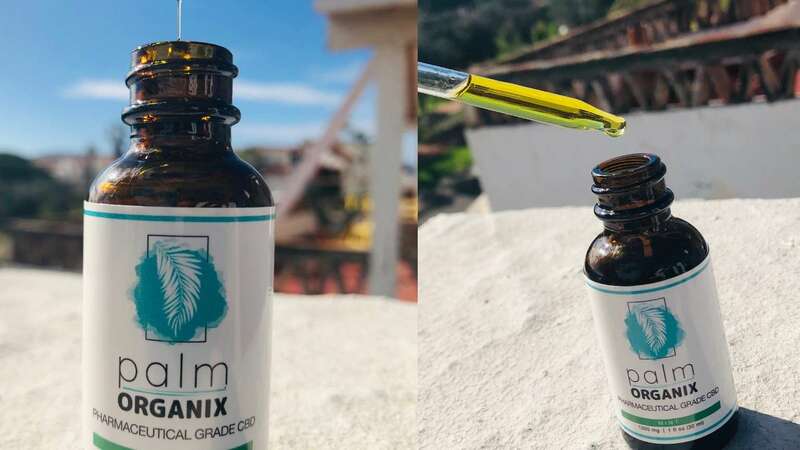 If you’re someone who doesn’t like that natural taste, but still want to try Palm Organix, we highly suggest their orange-flavored 500mg tincture. If mint is more your thing, though, they do offer a 500mg Mint CBD Tincture as well. For those looking for the smallest dose possible, Palm Organix 250mg Mint CBD Tincture would be your best bet. Each dropper-full contains 8.33mg CBD for those who don’t need much to get the job done. Ingredients in the mint 250mg tincture are the same as their 1000 and 500mg options: organically-grown full spectrum phytocannabinoid-rich hemp oil, hemp seed oil, grape seed oil, peppermint oil, and stevia. While it does have a bit of an earthy taste, we didn’t find it to be quite as strong as with the mint tincture. It’s still there, it’s just not as overpowering. Something to keep in mind if you’re interested in checking out Palm Organix smaller serving size. We love, love, love discovering emerging CBD companies we feel we can stand behind. 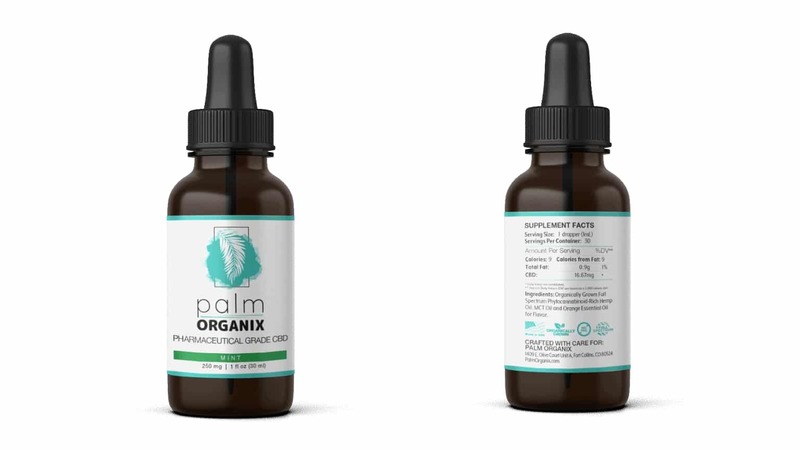 After trying Palm Organix selection of CBD tinctures, we’re happy to say we just found another one. From the simplicity of their products sourced from organically-grown US hemp that are made with all-natural ingredients, to the ease and layout of their website and the principles on which their company was founded, we truly believe Palm Organix has a solid foundation on which to build a successful future in the rapidly growing CBD industry. What’s more is that all of their products ship FAST and FREE (anywhere in America) and are third-party tested for quality and transparency so you know exactly what you’re getting with each and every batch produced by Palm Organix. Simply scroll to the bottom of their site where you’ll find them easily accessible. Click here to try Palm Organix CBD Tinctures for yourself today!